Previously, on MinerBumping... Andreas Shiyurida, a self-proclaimed "innocent newbie" with five years of EVE under his belt, had an altercation with Agent Minx Mattel. Said altercation resulted in the loss of Andreas' unlicensed Ventures, one after another. Everything seemed to be going well until Andreas demanded reimbursement for his most recent gank loss. Andreas had no basis for his reimbursement claim. He knew perfectly well that he should've docked up; he had even warned everyone else in the system to do so. The odds did not seem to be in miner's favor. Even so, Agent Minx let him know that there was a higher authority that he could petition. Now there was only one question: Did Andreas care so much about his Venture that he would dare to beseech the Saviour of Highsec? Protip: If you want to get on my good side, it's probably not a good idea to refer to my Agents as "idiots". Especially since the Code requires you to show them respect. Also, "all my implants"? More like "all my implant". 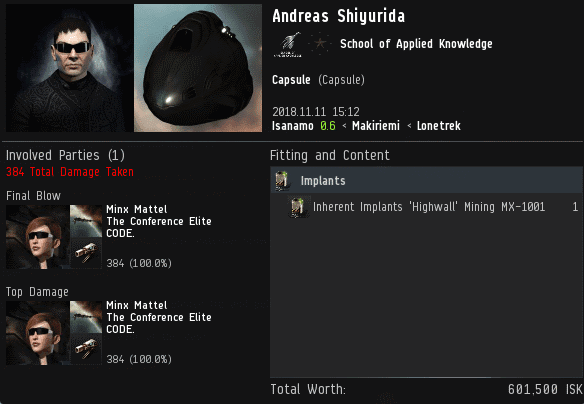 And a mining implant, at that. But there was another intriguing dimension to Andreas' reimbursement request. He was a New Order shareholder. In fact, by a bizarre coincidence, Andreas had become a shareholder just a few days earlier. Were his motives pure--or impure? And just how many shares was Andreas willing to buy in order to set his hostile takeover plan into motion? We've sold over 1.6 million shares, by the way. Better get the word out. Shortly after sending in his reimbursement request, Andreas got ganked yet again. It was only a matter of time before Andreas was down to his last Venture. Our Agent made repeated efforts to help the miner get out of his rut, but to no avail. Andreas Shiyurida was a bot-aspirant. Only a carebear would come up with a revenge plot that involves mining in highsec in an Orca. I hope he does get an Orca eventually, though. I know a few people who would love to help him test its tank. X up for the blue ring bang of an orca kill. Did that miner just say his future Orca can't be ganked? all my ships are called after CODE agents. it always reminds me of the true enemy. You should change your name to "Nevermind" because no one cares. I am also gay for big John, and I am too ignorant toknow the difference between "they're" and "there" so when I communicate via text it looks like I am retarded and should never have kids.